Over the next few days and weeks, I will be providing some grades for each player to suit up for the Sabres this season. The evaluations will be done in groups, beginning with the goaltenders. 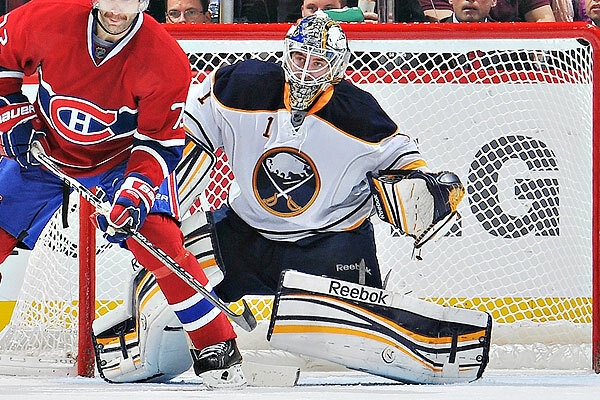 Overall, the Sabres goaltending wasn’t good enough this season. Based on numbers alone, both Miller and Jhonas Enroth would be right in the middle of the pack among their peers. However, it was an up and down year for each highlighted by rough patches and some great play. 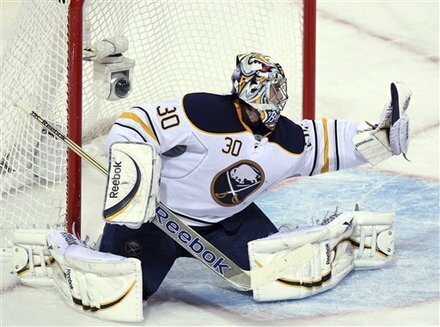 Miller’s hot streak to end the season was one of the main reasons the Sabres were even alive in the Eastern Conference playoff hunt. His slump through November and December was one of the main reasons Buffalo was so deep in the Eastern Conference. Overall, Miller played some very good hockey for long stretches. Obviously the run he began in January all but erased the ugly stats he developed earlier in the season. I would contend that a great deal of his struggles were tied to the long recovery from his collision with Milan Lucic. The injury itself may not have done as much damage as the lengthy recovery period Miller went through. A simple eye test would show that he wasn’t back to normal until well into January – nearly two full months after the injury. Critics and apologists should all be able to agree that Miller’s season needed to be better. However, when healthy, I would argue he would have produced one of his best professional seasons to date. His play in early October was stellar, as was his final three months. There were a couple appearances that hurt his numbers – when he was injured and stepping in for Enroth in Philly – but his play at the end of the year all but righted the ship. Miller’s play has always been more about his actual results rather than strictly numbers. Goaltending has always been about making the big saves when necessary, that doesn’t always mean your numbers will be Hasekian. For Miller, there is plenty of room for improvement. I would say a good offseason and a run of healthy hockey could certainly help shake some of the critics from his back. Enroth, like the Sabres as a whole, basically had two seasons rolled into one. Enroth’s early season success won him plenty of praise but his slump to end the year has led many to forget some of his accomplishments. Simply going off statistics would paint a picture that Enroth played some good hockey but wasn’t able to get any victories. That would be about half true. Enroth’s play stayed pretty even for most of the year despite his team being unable to give him much goal support in a number of his losses. There were a few games in which he gave a fairly uninspiring effort, but I would say most of his losses (December) were due to lack of goal scoring from his teammates. His lack of playing time turned out to be a big issue. However, not winning since November is also a big issue. A lot of people were quick to anoint Enroth as the goalie of the future last spring, but I think he may have regressed some since his thrilling run of wins. Perhaps the only regression came in the court of public opinion. But that is all that seems to matter with many fans. In my opinion, he simply settled into his niche as an NHL goalie. He is a strong netminder who could probably be a 1B starter for some teams. However, he probably isn’t going to steal you very many games. Of course, no one could have stolen a game the way the Sabres played in the middle of the season. MacIntyre only saw spot action with the big club. His numbers are the best among the three goaltenders, so he probably should be the starter, right? I thought it was a wise move to sign MacIntyre for depth in the AHL. However, I’ve never been too big of a fan of his game. I understand he has done wonders at the AHL level, but I never saw him much potential beyond that. Taking that into consideration, I don’t think he gave the organization what they expected, nor was he given much of a chance. David Leggio surpassed MacIntyre on the organizational depth chart, which is excellent for his development. The MacIntyre signing was one that was designed to help Rochester. He ended up not being a factor for them, which is pretty unfortunate.